Home Remedies for Leaky Gut Syndrome: Ever heard of Leaky Gut Syndrome? Wondering what it is? Also known as intestinal hyperpermeability, leaky gut is an increasingly common disorder that occurs when something goes wrong in the complex process of digestion. In this condition, perforations develop and undigested food, toxins, and other harmful substances return back into the body. Leaky gut syndrome can be the starting point for a wide range of digestive conditions, from intolerances to certain foods to inflammatory bowel disease. It can also lead to Type I diabetes, Crohn’s Disease, and Celiac disease. If you suffer from this condition, you can use home remedies to treat it naturally and steadily get your gut health back on track. The best way to treat leaky gut syndrome is to eliminate foods that cause damage to your intestines. Alcohol, refined sugar, excessive caffeine and processed foods have all been linked to a leaky gut. These foods boost the growth of bacteria, yeast, Candida and other pathogens in the gut, which in turn release toxins called exotoxin that causes damage the walls of the gut and enlarges the tight junctions that cause your gut to literally start leaking. Avoid coffee, alcohol, processed foods and even refined sugar. This is one of the first things you need to do start healing your gut. Related: How DNA Test Can Help Unfold The Reason For Gastric Distress! One of the best ways to heal the gut and treat leaky gut syndrome is to consume bone broth regularly. It contains amino acids that can help in healing cell walls that are damaged, namely glycine and proline, as well as collagen. Bone broth also has other health benefits, making it important to include it in your regular diet. It takes a lot of time to make this broth, but it is worth the time and effort. Buy some high-quality meat with bones from your local butcher. Prepare the broth with other ingredients that can help your gut. Drink hot bone broth whenever possible. Fermented vegetables is one of the best home remedies for leaky gut syndrome. They are rich in natural probiotics and acids that help in balancing the pH in your intestines. There are many popular fermented foods that you can add to your regular diet, such as sauerkraut, kvass, and kimchi – they will do wonders to your intestinal health. Include fermented vegetables in your regular diet. Also, increase your consumption of steamed fruits and vegetables – they can effectively heal a severe leaky gut. Increasing your intake of probiotic foods is another excellent way to heal a leaky gut. Probiotics stimulate the production of good bacteria, which in turn helps in the absorption of nutrients and support your immune system. Eating probiotic foods can help in healing the lining of your intestines and treating the condition. Add yogurt, coconut kefir and kefir to your diet. Pickled vegetables, such as pickled beets and dill pickles, are also helpful in providing your body with the probiotics it needs to treat a leaky gut. Related: Top 11 Natural Home Remedies for Acidity – How To Cure Acidity? Licorice root has been used to treat a wide range of diseases and ailments for hundreds of years. 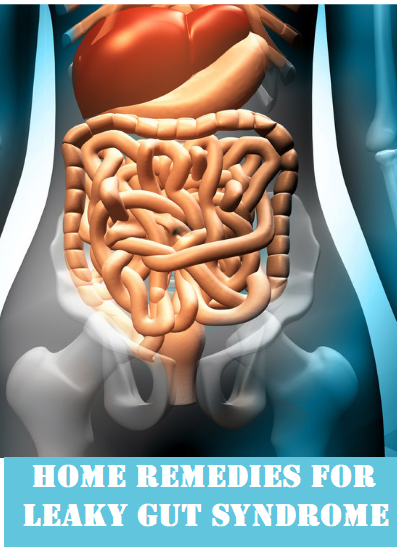 It is also known to be one of the most effective home remedies for leaky gut syndrome. This herb contains important active compounds – flavonoids, stilbenoids, triterpenoids, and coumarins – that help in reducing inflammation of the intestines. Take 6 grams per 130 pounds of body weight of non-DGL licorice root extract daily for up to 4 weeks. Or, you can take 200 to 300 mg of DGL licorice root 2 to 3 times a day. Note: If you are pregnant or have kidney, liver or heart conditions, you should avoid taking licorice root. Aloe vera does not only help with skin problems but can be an extremely effective natural treatment of several health issues too, leaky gut syndrome being one of it. This amazing plant has anti-inflammatory properties that help in relieving the symptoms of the condition and healing the intestinal lining of your gut. Consume 2 ounces of aloe vera gel 6 times a day to relieve the pain and inflammation that comes with a leaky gut. Mix 2 tablespoons of aloe vera juice in 1 glass of water. Drink this mixture once a day until you notice an improvement. Oregano oil is a strong natural treatment that directly fights the damaging flora that is causing leaky gut syndrome and heals the leaky gut. It has antifungal properties that help in stopping the excessive growth of yeast and Candida in the intestines. Oil of oregano is a great option for people who suffer from a leaky gut as it works quickly to eliminate the problem. Mix 3 drops of oil of oregano in 1 glass of water. Drink it 2 times a day. Increase the dosage gradually up to 6 drops 2 times daily. Repeat this remedy until you notice an improvement in your condition. Garlic is a super-ingredient, when it comes to home remedies, no matter the condition or ailment that needs to be treated. It is a powerful herb that has been used for centuries for its medicinal properties. Garlic is helpful in getting rid of excess yeast, balancing intestinal pH and aiding in digestion. If you are looking for one of the most potent home remedies for leaky gut syndrome, garlic is all you need. Chew 1 clove of garlic 2 times a day. Use garlic-infused olive oil in your cooking to increase the amount of garlic you consume. You can also take garlic supplements. However, it is advisable to consult a doctor before you do this. Are you wondering how something spicy is going to soothe your stomach? Well, you might be surprised to find out that cayenne pepper is a really great stomach soother. It stimulates the digestive process and helps in making your intestinal pH more alkaline, which in turn kills bad flora and promotes the good flora in your gut. Include cayenne pepper in your daily diet. One way to do this is to use olive oil infused with cayenne pepper. Another option is to take a cayenne pepper supplement. However, make sure that you consult a doctor first. Do you often like to sip a cup of chamomile tea? You’ll be happy to learn that chamomile tea is also great to treat leaky gut syndrome. It not only helps you sleep better, but has anti-inflammatory properties that ease and prevent inflammation. You can use chamomile instead of NSAIDS whenever you experience pain, inflammation, indigestion and gas. Boil 2 to 3 teaspoons of dry chamomile flowers in enough water to fill your favorite mug. Turn off the heat, put a lid on the teapot and allow the flowers to steep for 10 minutes. Strain and drink 2 to 3 times a day. As you can see, there are many home remedies for leaky gut syndrome that will not just treat the condition, but also prevent its recurrence. You can use them individually or in combination. What is great about these remedies is that they offer other benefits that improve your overall health. So if you have a leaky gut, go ahead and follow any of these effective home remedies and feel better than ever.